Dr. Iraj Poureslami's work on health literacy is creating much-needed opportunities for patients to feel empowered and informed in order to take control of their own lung disease. Talk about your asthma literacy project. BC is home to 16 percent of all immigrants who settle in Canada – many of whom arrive with pre-existing chronic conditions including asthma and who do not have their asthma under control. In fact most people with asthma say they have their disease under control, but studies suggest that less than half actually do. For many people, asthma is a disease that can be quite easily controlled through proper usage of medication and avoiding irritants. But if you don’t understand how to take your medication or what irritants to avoid, asthma can quickly become a very serious problem. We realized entire communities in Vancouver were not receiving the clear communication they needed, and that simply translating existing materials into other languages wasn’t enough. And we believed it was critical we take into account the attitudes and perspectives of the audience, which are sometimes quite different from those of the medical professionals who create the material. We decided try and create something better. And we started by reaching out to local Chinese-, Mandarin- and Punjabi-speaking communities. Through focus groups within these various communities we gained insights into what was missing and how to more effectively reach and communicate with these groups. We found that challenges arise not only because of language barriers – though this is significant – but also because of a lack of trust for the health-care system. This is due partly to cultural beliefs, their previous health-care experiences, and also because many are simply unaware of our existing health system and practices. The discoveries were surprising. For example, some people revealed that they are often inclined to hide their asthma because it’s associated with tuberculosis, a stigmatized disease in some cultures, while others people expressed that they would be more willing to quit smoking if it is harming a loved one. Armed with better understanding, we created ‘community videos’ in Punjabi, Cantonese and Mandarin featuring actual focus group participants as they acted out scenarios conveying messages about asthma management. Patients from these communities who watched the videos dramatically improved their inhaler skills and their understanding of the steps they needed to take to control their condition. Yes, using a similar strategy that we used for our asthma project, we developed culturally sensitive and linguistically relevant post-discharge educational materials for COPD patients in Vancouver. The aim was to educate COPD patients on topics important to the effective self-management of their lung condition including pulmonary rehabilitation and exercise, breathing techniques, anxiety and depression, advanced care planning , travel and oxygen, etc. As part of the project we produced videos and pamphlets in Chinese (Mandarin and Cantonese), Farsi, Filipino, Korean, and English. The impact of these interventions has been impressive and a number of manuscripts regarding this research have been published. In the end what we’re doing is all about not wasting patient time with medical mumbo-jumbo but instead speaking in the patients’ own languages – not just linguistically, but culturally. 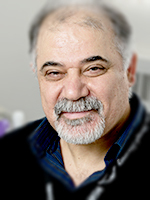 Dr. Poureslami is a senior research scientist at Faculty of Medicine, Respiratory Medicine Division, University of British Columbia. His main goal is to address socio-cultural and environmental determinants of health and quality of life in newcomers and ethnocultural communities in Canada. Dr. Poureslami is a WHO (EMRO) mentor of health promotion, WHO Early Childhood Development (ECD) Knowledge Network consultant, and member of the Canadian National Health Literacy Expert Panel. He is a recipient of BC Lung Association research grant funding. Dr. Fitzgerald is Head of the Respiratory Medicine Divisions at both UBC and Vancouver General Hospital and co -Director of the UBC Institute for Heart and Lung Health. He is also the director of the Centre for Heart and Lung Health and a Senior Scientist at the Centre for Clinical Epidemiology and Evaluation at the Vancouver Coastal Health Research Institute. His clinical and research interests include asthma, chronic obstructive lung disease, tuberculosis, and health outcomes. Dr. Fitzgerald is also a BC Lung Association Medical Advisory Board member and a recipient of BC Lung Association research grant funding.